With over 600 different sizes of cardboard boxes to choose from, we’re confident that we can supply a box to fit any size or shape of product. But once something has been successfully shipped the cardboard then must be properly disposed of. Everyday at Rajapack we get asked questions about how to recycle cardboard boxes or how to recycle cardboard boxes at home. These questions are so popular that we’ve decided to focus this post on exactly that, including useful info on where to recycle cardboard boxes. If you’re not familiar with cardboard boxes and what they’re made from then we’ve put together some brief info to get you up to speed. Firstly, what does corrugate cardboard mean? This is the structure of the board and the combined inner layers of liner and fluting which gives boxes their rigidity and strength. All boxes we sell at Rajapack are made from corrugate cardboard. The layers of liner in a box are usually made from test paper which is a lower grade of Kraft and Kraft paper which is made from virgin fibres and is a higher grade. These liners provide strength and support to the fluting which runs between them and can offer some resistance from water and the elements. The material used here means you can write or print on the box for easy identification. Finally, what is fluting? Fluting is the word used to describe the wavey cardboard that is between the two liners. It’s wavey shape gives strength to the liners that surround it and the direction and distance between the flutes can vary depending on the strength of the cardboard box. More waves means a box has more strength. Can corrugated cardboard be recycled? Corrugate board is one of the most popular types of cardboard we use, found in corrugated cardboard boxes and packaging where it offers excellent strength and resistance to knocks and bumps. The inner layer of corrugate, sandwiched between two layers of Kraft paper, make it strong and resilient. The big question we get asked is “Can you recycle corrugated cardboard?” Absolutely! The great thing about corrugated cardboard is that it can be completely recycled and used to make other cardboard boxes and cardboard products. 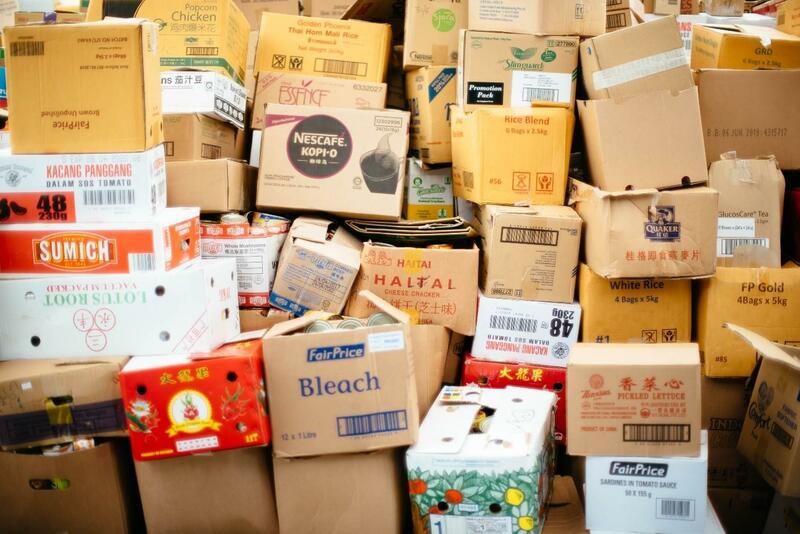 Recycling your used cardboard boxes saves the trees, energy and materials used in the manufacture of new boxes. At Rajapack we have a range of eco-friendly packaging, including our boxes which are made from 75% recycled fibres on average, and the ‘recycling loop’ for corrugate is so efficient that used boxes can be recycled, remade and reused in just two weeks! So, our Sales team is frequently asked, where to take cardboard boxes to recycle them? Many councils now offer recycling boxes for homes (usually coloured green or blue) where you can place items such as paper, aluminium and cardboard including corrugated cardboard for regular collection. There are also local recycling sites across the country which accept corrugated cardboard for free. You can check your recycling collections and find local recycling sites in the ‘Recycling Collections’ section of the government website, an easy to use page where you only need to enter your postcode. Other sites such as the Recycling Locator on recyclenow also make it easy to find information on where you can recycle locally. If a material is biodegradable then it naturally breaks down and decomposes in the environment in a way that doesn’t harm it. Food waste, for example is highly biodegradable usually breaking down naturally and safely in a short amount of time. 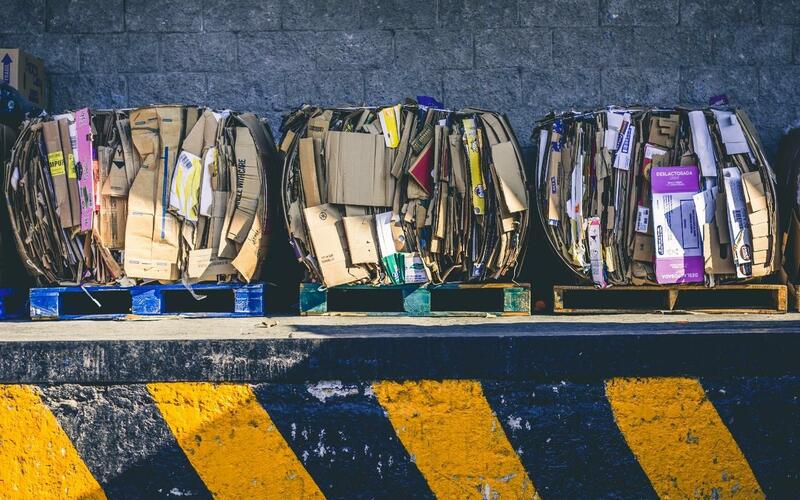 Cardboard is a biodegradable material – corrugated cardboard will break down and decompose naturally, though it can take a long time depending on the environment that it’s in. It breaks down quicker if it’s wet and broken up into small pieces, and so is great for home composting if you have a compost bin. If you are disposing of it at home, then make sure to cut it into small squares and wet it through thoroughly. There’s lots of useful information online about how to prepare it for composting. 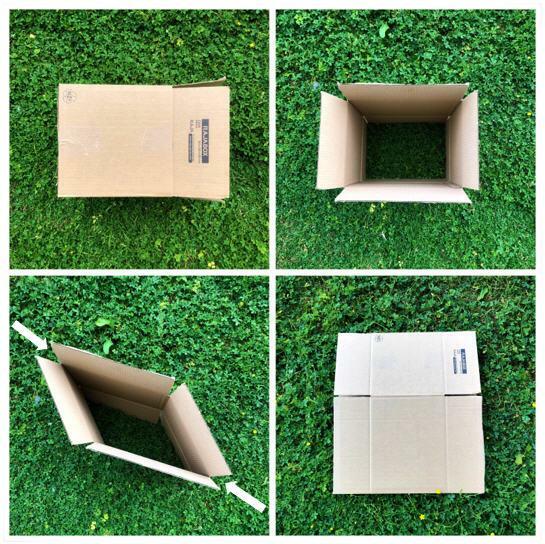 Once you’ve finished with a cardboard box, it’s quick and easy to break it down so that it can be properly stored, ready for recycling or prepared for compost. The first thing to do is to remove all plastic or vinyl packaging tape from the box. This will have been used to seal it shut, and usually runs along the top and bottom flaps to keep it secure. This should easily pull off and can be disposed along with your normal rubbish. If paper tape has been used to seal the box then you can leave this on as it can be recycled along with the cardboard box. If you’re composting then it will biodegrade along with the cardboard, so it’s safe to leave on. It’s what makes paper tape more eco-friendly than vinyl or plastic tape. Once the non-recyclable tape has been removed, then you can easily flatten the box out. Ensure the top and bottom flaps are straight (not at right angles to the box) and push the opposite corners together. The box should close up and you should then have a flat box which is much easier to store or transport. If you are recycling it, be sure to keep it in a dry place ready for collection as it can be very difficult to recycle and handle when wet. Read How to Recycle Packaging Materials for more information on recycling packaging materials, and if you’d like more information about the range of cardboard boxes that we offer, any help or advice on purchasing packaging or the best way to dispose of it, then simply get in touch with our team of packaging experts who are on hand to help. Simply visit www.rajapack.co.uk or contact our team on 0800 542 44 28, or sales@rajapack.co.uk. This entry was posted in Environmental packaging, Packaging Industry News and tagged biodegradable, Cardboard boxes, eco-packaging, how to dispose of cardboard boxes, Recycling on July 17, 2018 by Rajapack UK.